Your Happy Wife – Happy Wife, Happy Life! To give your wife a break from the stress at work and home, you can plan a romantic getaway. It does not have to be at a faraway place or at a grand destination. In fact, you can take her to a simple bed-and-breakfast over the weekend if both time and budget are limited. It does not matter where you go as long as you make sure that the trip is all about relaxation and showing your wife how much she means to you. Prepare a candlelit dinner at home. Your wife does almost everything in the house. From the time she wakes up to the time she goes to sleep, your wife takes care of the family. 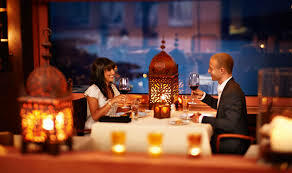 To reward her for being a dedicated mom and partner, surprise her with a romantic candlelit dinner at home which you personally prepared and cooked. It would be great if you could prepare her favorite meal or a dish or dessert that she has been craving for days or weeks. However, if you are thinking of surprising your wife in the morning instead of night, you can do a breakfast-in-bed meal, too! Send her a gift at work. When your wife is at work, surprise her with a bouquet of flowers or a box of chocolates. It will definitely make her day and it will also be a stress reliever for her after being burdened with lots of paperwork or tasks. But if you have time on your hands, you can personally surprise her at work, too. During your lunch break, head over to her office and invite her to eat at her favorite restaurant nearby. On a normal or a dull night, surprise your wife by serenading her with her favorite song. You do not need to have a good voice or a fancy instrument to accomplish this — you just need to sing your heart out. Your wife will surely be glad and pleased by the gesture. However, if you are not into singing, you may want to invite your wife to slow dance, even if it’s just in your living room. Put on your favorite love song (or your wedding song) and dance the night away with her. The last of the 5 most romantic things you can do to surprise your wife is renewing your vows. Not all couples celebrate their wedding anniversaries by marrying each other again so if you do this, your wife will surely be stunned. Plan a simple but beautiful event, invite your close friends and family, and make your wife the happiest bride once again. Every relationship goes through a rough patch and married couples, no matter how long they have been together, are not exempted from this reality. There are a lot of things that can cause a fight between spouses. Sometimes, it can be as petty as who forgot to lock the door before they left or as serious as financial matters. Most of the time, couples end up shouting at each other when they are mad or they walk out on one another. However, there are some arguments which can get really offensive, too. As much as possible, do not talk to each other when the issue is still fresh. Although it is advisable that you talk your problems out, it is nonetheless necessary that when you face each other, your mind is no longer clouded with emotions so that you can deal with your situation better. Taking a breather is the simplest among the 4 ways to resolve arguments before they get out of hand because it lets you think things thoroughly. After knowing the problem, try to get out of the house and take a walk for a while just to clear your head. If the argument was through phone, avoid texting or calling your partner just to show how mad you are. Steer away from any forms of communication for a while. Try to assess the situation first, think of ways to compromise, and then return when you can suggest a solution. When you are filled with emotions, there is a tendency to raise your voice at your spouse. Do not do this. Never shout or scream at your significant other when you are in the middle of a fight as this will only worsen the situation. When you and your spouse are fighting, try to maintain a calm demeanor. Speak at moderately low voices and try to filter your words. Remember that shouting or saying ill words will not help you in your argument so better do away with it. It may be difficult but try to listen to your spouse’s explanation. There are times when you want to ignore what he or she is saying because you feel hurt or betrayed but do it anyway. Listen to his or her every word, do not interrupt when he or she is speaking, and do not react right away. To resolve your fights, it is very important that you apologize. It doesn’t matter if you were wrong or right. What matters is that you forgive and apologize. If you are the one apologizing, make sure that you really are sorry for what you have done and that you will make up for it. If you are the one who is asked of forgiveness, only forgive when you are ready. In resolving arguments, it is very crucial that couples find a way to compromise. You should both swallow your pride and remind yourselves that it is your marriage which is important and not your fights. The team at Happify, a website devoted to the “Science of happiness” put together this fantastic infographic that will jog your memory everytime you feel your relationship slipping a bit! When people get married, they are all hopeful that they get to live a happily-ever-after life. Couples enter into a marriage happy and content. But as years pass by, a lot of things change and sometimes, the marriage changes for the worse. Some couples make it a point to make their marriage stronger while some end up separating. There are also some couples who acknowledge the problems in their marriage but still refuse to give up. These couples go through marital mediation. If your marriage is on the rocks but you do not want to consider divorce or separation, you may want want to avail marriage mediation services. • What is marriage mediation? Marriage mediation is an extrajudicial process wherein couples negotiate and resolve the conflicts involving their marriage. The couple lay down their problems before a marriage mediator and they willingly cooperate to find a compromise or a solution to these dilemmas. This is a process availed of by couples who do not want to entertain divorce as an option to their problems. • Who is a marriage mediator? A marriage mediator is a person who is trained to resolve marital issues. He or she uses alternative dispute techniques to help the couple identify and solve their problems. Also, a marriage mediator is responsible for providing advice and forms of encouragement as to how the couple can improve their married life. 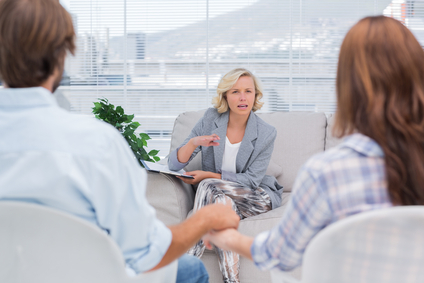 Most of the time, a marriage mediator is a duly licensed psychotherapist or counsel. • What problems can be included in marriage mediation? Any issues involving the married couple can be the subject of marital mediation. Most of the time, the source of conflict between a couple are financial issues. A marriage mediator may assist the spouses in finding a way to solve this matter and at the same time, plan a concrete way of utilizing their finances without putting so much strain in their married life. However, other issues such as infidelity, trust, miscommunication, and difficulty in raising children can also be the problems to be addressed in marriage mediation. • How much do marriage mediation services cost? Normally, mediators charge their clients by the hour and the fees of each marriage mediator vary. There are some mediators who charge $150 an hour while there are some, due to their expertise and experience, charge as high as $350. Moreover, marriage mediation happens in sessions as short as 10 visits or as long as 20 appointments. Marital mediation may cost a lot but compared to divorce fees, it is significantly lower and will not be as stressful, financially and emotionally. • Why is marriage mediation important? If you are very committed to staying together with your spouse, mediation will not just help you accomplish that but will also help you improve your relationship. Aside from helping you reach a solution to your marital problems, marriage mediation also lets you communicate effectively with your spouse and strengthen your relationship. Simply put, marriage mediation is important because it will save your marriage. Does Your Wife Feel Lonely in Your Relationship? One of the nicest things about being married is that you are not alone. You will always have someone to share your joy, sadness, triumphs, and failures with. When you are married, you have a constant companion and a trusty confidant. However, not all marriages work this way. There are some married couples who, after some time, grow apart. There are a lot of couples who live in the same roof but do not live the same lives. The worst-case scenario is that you’ll both be calling a divorce lawyer. If you are one of the many husbands who are always preoccupied with work or are rarely at home, there is a high chance that you may be growing apart from your wife. A good husband will be concerned about this and will find ways to solve this problem. 1. She has trouble sleeping and she seems to be losing weight. Lonely people do not sleep well at night and do not have the appetite to eat well. If your wife is often restless in the morning and is not eating as much as she used to, she could be displaying signs of loneliness and depression. 2. She is often quiet and does not seem interested in what you say or do. If your wife no longer pays much attention to you or is awfully quiet during dinner, she may be feeling depressed about your relationship. If she does not confide in you about what is bothering her, chances are, it is your relationship which troubles her so much. She may be isolating herself from you and your relationship. 3. She spends so much time with her friends. Perhaps the reason your wife could be hanging out with her friends more than usual is that she finds comfort in them. She gets to confide in them and she feels less alone. She may be using this as a diversion from her loneliness in your relationship. If you have noticed the signs that indicate your wife is feeling sad and lonely in your relationship, then it would not be too difficult for you to resolve the problem. The most possible reason your wife feel lonely in your relationship is that you no longer talk to her. During dinner, you may be too preoccupied with what happened at work that day or you may be too stressed to even ask how her work or day was. Try to change this about yourself and make an effort to talk to your wife. Share stories about your day, ask her about her plans for the weekend, or even commend her cooking. Even the simplest compliments or words will surely make your wife feel less alone. Your wife may also be feeling lonely because you are rarely at home. Provided that your work keeps you busy and away, it is not enough reason to ignore your wife and her needs. When you are not too busy or at home, spend some quality time with your wife. Watch a movie together, go on dates, or even plan a romantic vacation with her. Make her feel that despite your busy schedule, she is still your priority. In simple and grand ways, never forget to remind your wife how much you love her. A woman will not feel neglected if she is constantly reminded of her husband’s love. Kiss her before you leave the house, constantly check up on her during work, and even send her sweet messages or emails if you are apart. Being a wife is one of the most difficult roles that a woman can take. Aside from constantly making sure that her husband is both contented and comfortable, she is also responsible for taking care of the children and the house. With all the effort and sacrifices that she makes, it is only right that a wife be treated nicely and pampered from time to time. 1. Take her out on dates. 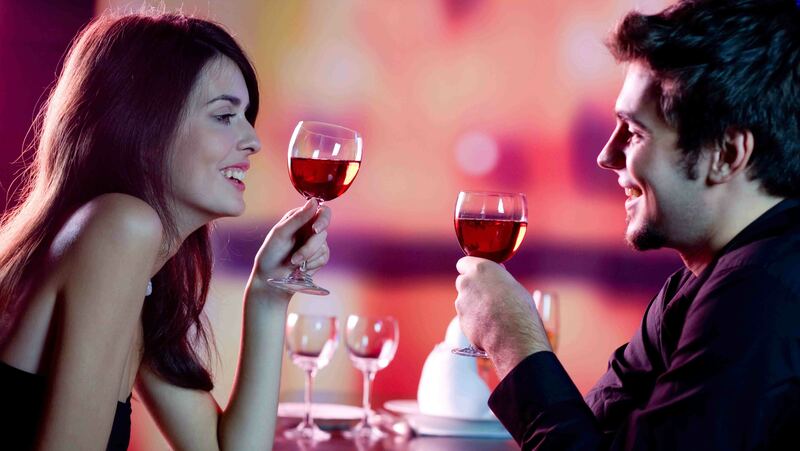 On weekends, take your wife on a date at your favorite restaurant or invite her to watch a movie with you. To make this work, prepare the reservations beforehand and hire a babysitter for your kids. That way, your wife would not even have to worry about the minor details while you are out. Instead, she will just relax and enjoy the night with you. 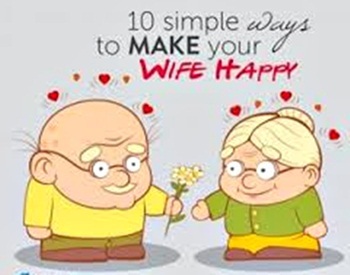 Make your spouse happy by writing romantic letters or notes from time to time. Tell her how much you love and appreciate her through those letters. Women are very appreciative when it comes to small gestures so rest assured that your notes will definitely leave a smile on her face. 3. Never waste an opportunity to say you love her. Most often than not, men forget to say “I love you” to their wives before they leave for work or before they hit the sack. Make your wife happy by always saying these words and make sure you mean them. 4. Do the household chores. From time to time, give your wife a chance to relax by offering to do the dishes after lunch or dinner. She will surely appreciate this, especially if she just spent so many hours preparing your meal. 5. Take care of the kids and let her go out. Even if your wife lovingly and willingly cares for and dedicates her time to your children, give her a chance to go out of the house once in a while to be with her friends. Offer to take care of the kids for a change. 6. Satisfy her in bed. Your wife is not just your life partner but she is also your lover. To keep her happy and contented with your marriage, always strive to satisfy her in bed even if that means researching new sexual moves or keeping yourself in shape. When you were pursuing her, you showered her with bouquets, chocolates, and even teddy bears. Be consistent and surprise your wife by giving her gifts, simple or grand, for no apparent occasion. 8. Always look good for her. Your wife makes it a point to stay beautiful in your eyes, so it is only proper that you do the same for her. Do not be complacent when it comes to your appearance. To make your wife happy, always look good for her. 9. Always show your affection. Embrace her after a long day at work, kiss her before you leave the house, or touch her when she feels sad and vulnerable — always show your wife how much you love her. 10. Kiss her good night — every single night. Even if you just got had a fight or if she slept earlier than you did, always kiss your wife good night. She may not notice this all the time, but when she does, it will definitely make her sleep better.